Need more apps for your favorite device? iOSnoops can help! Here are 39 iPhone and iPad apps that have just gone free. 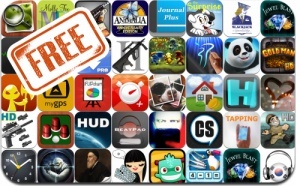 This apps gone free alert includes Jump Dewds, iSniper 3D Arctic Warfare, Gun Building II, Outwitters, Victory March HD, Music Downloader ∞, Magic Painter, Real Strike, Journal Plus, Sleep Time, and many others.